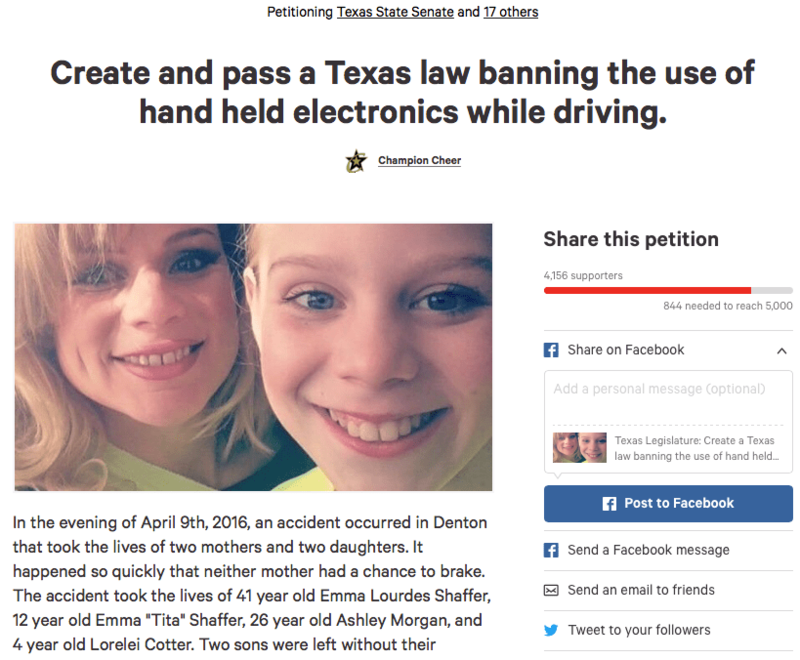 The students of Champion Cheer All Stars cheerleading gym have collected over 4,000 signatures in one week on a petition asking the Texas legislature to ban people from driving while using an electronic device. In the evening of April 9th, 2016, an accident occurred in Denton that took the lives of two mothers and two daughters. It happened so quickly that neither mother had a chance to brake. The accident took the lives of 41 year old Emma Lourdes Shaffer, 12 year old Emma “Tita” Shaffer, 26 year old Ashley Morgan, and 4 year old Lorelei Cotter. Two sons were left without their mother. Two men lost the loves of their lives. Texas is one of the last states — there’s only four left — without a ban of some kind on driving while using a cell phone, according to KHOU. The Legislature did pass a ban once, but former governor Rick Perry vetoed it. We’re living with the consequences of inaction. In 2015, 476 people died in Texas from crashes caused by distracted driving, according to TXDOT. Most likely, about 500 will die again this year. You can join cheerleaders (and nannies) across the state who want to end these deaths by signing and sharing the petition today. The photos don't lie -- these protesters actually called some new stripes on the street a "Nazi lane." We Have the Tech to Stop Distracted Driving. But Do We Have the Will? What is stopping us from implementing solutions to prevent distracted driving? We have the technology. The problem is, the smartphone industry doesn't want to use it.